22 Winchester Rimfire ammo is a small caliber, rimfire cartridge introduced for Winchester’s 1890 slide action rifle. 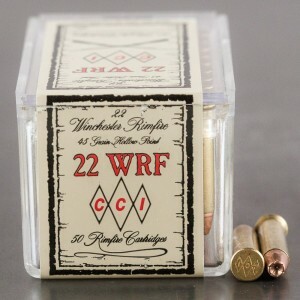 22 WRF is significantly more powerful than the 22 long rifle, and is capable of taking a variety of small game. However, it is not as accurate as the standard 22 long rifle. The 22 Winchester Rimfire did become popular for a short period and many rifle manufacturers began producing single shot rifles, these include Remington and Stevens rifles, in addition to the Winchester rifles. The 22 long rifle received a significant upgrade it the early 1900s, that added several hundred feet per second to the round. The 22 Long rifle was also cheaper, which lead to an end for the 22 Winchester rimfire, at least in most mainstream shooting circles. The 22 Winchester rimfire may not have reached a large following, but the round is still popular to owners of the unique Winchester 1890 Slide action rifle. The caliber can fire a 40 grain round at 1,440 feet per second. This little pump action rifle is a classic piece of Americana, and remains a popular collector’s weapon. The rifle has been replicated many times, but those desiring the real thing, the 22 Winchester Rimfire and the Slide fire rifle is the way to go. My dad's childhood rifle needs special ammo. Ammo to Go was the only on-line supplier. They get 5 gold stars for making old-style ammo available. I am so glad that I happened on this website, it was pure accident!! I had been looking for a certain .22 ammo for a long time, and this site has been the only place that I can get quantities of it!! The people helping me are wonderful, the site is easy to use, and when they say something is going to be there, you can take it to the bank!!! Great Product & Great Price!! I was very pleased with finding the product that I couldn't find in other places. It was exactly as quoted. Would recommend this company.